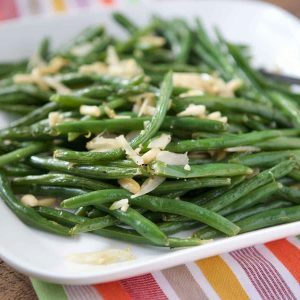 Roasted Green Beans with Almonds is a simple side dish that is perfect for holiday entertaining or to serve alongside your favorite weeknight meal. Toss the green beans in a large baking dish with the oil and sliced onion and season well with salt and pepper. Roast until just cooked through and slightly browned, about 15 to 18 minutes. Combine the almonds and zest in a small bowl. Sprinkle zest and almonds over green beans and toss. Roast for another 3-5 minutes, careful not to let almonds brown too much. Transfer green beans to a platter and squeeze juice from half lemon over green beans. Season with salt and pepper and serve.